← Waiting for an Update? Those of you who read yesterday’s post will know that I have been unwell for a few days with flu. I have been trying not to speak at all over the weekend because when I do it results in me coughing violently :(. It dawned on me yesterday that this has given me a small insight into the lives of people who either can’t or who find it hard to talk. 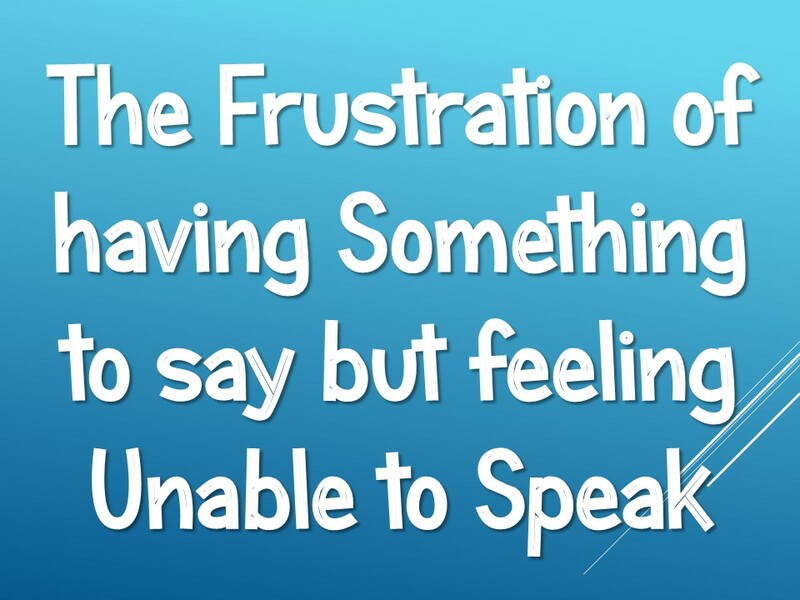 I have found it incredible frustrating having something worthwhile to say but feeling unable to say it, how much worse must it be to feel this on an ongoing basis? I know someone who struggles to talk and when he does speak, he often whispers. This person who I know well has a brilliant mind and great ways of looking at things and I have begun to wonder over these past few days how frustrating it is for him to have something to say but then feeling unable to say it? Previously, I have just felt frustrated when they won’t speak to me at times when I have asked them how something went but now I have come to consider a little of what their difficulty and frustration must be like. Beyond this, I began to think about people who have something to say but who feel unable to speak for a variety of reasons. Perhaps they don’t have the confidence? Perhaps they fear what will happen if they speak in the form of revenge or reprisals? Perhaps they think that their thoughts are so insignificant that they aren’t worth sharing? On one occasion Jesus made an important man called Jairus wait to talk with a woman. This woman who had a medical condition that led to her being ostracized by the community is given a voice by Jesus as he talked with her while making Jairus wait. If you would like to, you can read more about how Jesus gives this woman a voice. On another occasion, Jesus sat down at a well and talked with a Samaritan woman who had also been ostracized by her community. She was so surprised that Jesus wanted to talk with her, that it became part of the process by which her life was changed. You can read more about this in John 4. In Matthew 8, two very different people come to Jesus for help, the first is a leper and the second is a Roman soldier. The Jewish community would have found both these people repulsive (lepers were considered unclean and the Romans had invaded Israel), but Jesus treats them with respect as he listens to and responds to their cries for help. Jesus even points to the soldier as an example of great faith! Jesus takes what a person who would have been considered as a hated foreign invader says and shares it as something that is really important. Jesus wanted to hear people express themselves. When a blind man called Bartimaeus shouted out for mercy, Jesus asked him ‘what do you want me to do for you? The surrounding crowd kept shouting at Bartimaeus to be quiet but, but Jesus wanted to hear him! You can read the full story in Mark 10. Jesus chose 12 disciples who were definitely not the sort of people who the Pharisees would have picked. Among the 12 were uneducated fishermen as well as a revolutionary and a tax collector. These people were given a voice to talk with Jesus and to learn from him over the next 3 years. Even when they failed Jesus, he stuck with them and continued in his relationship with them. Jesus felt that was important to give everyone a voice, how can we follow his example? The person who I mentioned earlier who finds it hard to speak needs patience and not pressure. Direct questions increase pressure and lead to an even greater reluctance to speak, but patience will often lead to him saying a little in his own time. How can we create a healthy environment for people to have a voice? The sorts of people who have a voice in churches are often the articulate and one of my responsibilities as a church leader is to give a voice to people who would find speaking in front of others difficult. At Orchard Baptist we try to use a variety of feedback techniques such as writing ideas on post it notes and sticking them up (if everyone has the same number of post it notes each then everyone has an equal say). On Sunday mornings, we often give space for people to talk about what they have seen God doing. Instead of asking people to come to the front, I go to them with a radio microphone which appears to make it easier for people to speak. We also hold creative services that invite people to explore a Bible passage and to communicate it in different ways (read about an example here). Helping people to find ways that they are more confident communicating in eg writing, art, drama, using technology etc is so important in helping people to express themselves. How can you create a healthy environment for people to express themselves? How can you share your voice more? This entry was posted in change, encouragement, Everyone is valuable, Faith, Life experiences, Life in all it's fullness and tagged everyone is valuable, giving people a voice, helping people to express themselves, listening shows you value someone, you are valuable. Bookmark the permalink.